Mellow Monk's Green Tea Blog: Are you on a happy patch? Emotions have a collective existence, postulates Nicholas Christakis — meaning that we all affect and are affected by how those closest to us feel. 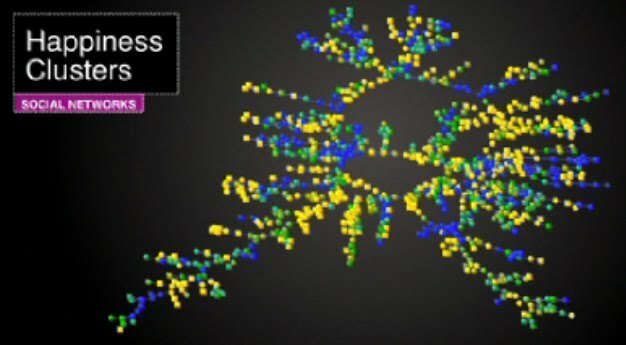 Looking at maps of human social networks — interconnected groups of friends, coworkers, relatives, families, friends of friends, and so on — Christakis and his colleagues found that happy people tended to be grouped together in clusters, like patches on a quilt. They also found that the odds that any given person in a human network is happy can be predicted by how many "happy" people to whom he or she is directly connected — in other words, whether that person is on a "happy patch." If you are not, you can always move to one or transform the patch you currently occupy into a happy patch, because the positive changes that disseminate out from you will in turn flow back to you. Even if you cannot reach out to others in person, remember that even a voice on the phone can be as soothing as actual physical contact. The Japanese tea ceremony teaches us to focus completely on our guests when serving tea, and the recipient to focus on the host. Both are utterly in the moment, focusing on their interaction through the tea. "Is my guest comfortable?" wonders the host. "Am I making him or her feel welcome? Am I preparing this tea as best as I can?" The guest in a tea ceremony, meanwhile, thinks "Am I taking in the beauty of the tearoom? Am I focusing on the hospitality I am receiving?" Thus, tea teaches us to not only be mindful, but to be mindful in a way that draws in others in a positive way, magnifying feelings of gratitude, hospitality, and togetherness — in short, making our patch a happier, mellower one.